Sometimes, I wonder how Facebook has dominated the internet world with its unbeatable presence. For a successful online business implementation, social media marketing over platforms like Facebook has become a requisite need for all organizations. If you have experience of working in this digital era from years, you must have been aware of what these Facebook insights are and how their evaluation help in founding a brand value in this highly competitive marketplace. In this internet driven atmosphere, social media marketers have become an integral part of any business organization because they play the most considerable role of monitoring and tracking the metrics of social media platforms like Facebook and reporting those measures to the managers for further evaluation on daily basis. Now, the first question that strikes in your mind is that how the measurement of FB insights helps in business branding. Another remarkable query is that whether the experts are reporting only the likes to the managers or they are just filtering the data to report only that information which is vital for effective business branding process. Customer centric marketing strategies yield the best results. However, before discovering the right answers for these questions, it is equally crucial to know what metrics are used for measuring Facebook Insights and why you need to measure the performance of your Facebook page. While evaluating the promotion of any business via Facebook, it is noteworthy to comprehend how many people reach your post, how many of those were able to engage with your post, and how many clicks the post has received from them. On the other hand, if you want to evaluate the Facebook metrics with better precision, it is important to extract the export files for scrutinizing the useful statistics. Login your Facebook business page. Click on the “Insights” that can be sighted in between ‘Activity’ and ‘Settings’ options on top of the page. 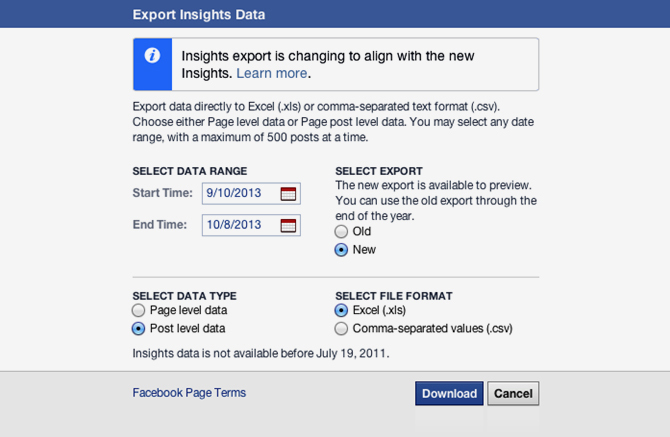 The Exports Insights Data dialog box will open asking you to tell Facebook what you want to export. Select “New” radio button under SELECT EXPORT option displayed on the Exports Insights Data dialog box. Keep the data range as default. You can download both page level data and post level data to get a better accuracy of your FB page insights however, you will have to download both these data separately by selecting the options one by one. Although there are various metrics used for measuring the FB insights for your business growth, but we will discuss about the most remarkable metrics in terms of their ratios, which are used for monitoring and tracking down the performance of FB pages. Let us know why these ratios are important and how we can measure them. Reach is the only metric that provides the gist of the performance of the post whereas Consumer is the metric that helps to evaluate the number of users who saw or click anywhere on your post in the form of like, share, comment, like click, video play expand comments, click profile of commentator etc. The ratio of consumers to the total reach reveals the influence of your content over the visitors of your Facebook page. This ratio signifies the number of users who have clicked over a post to the number of users who have just viewed the post. Why this ratio is vital: Measuring this ratio is very vital for a Social Media marketer because it helps in evaluating how a specific post engrossed clicks by taking in account the total users who saw this particular post. In this ration, the complete concentration is on the number of users reaching over FB page instead of clicks only. Why this ratio is vital: This ratio plays a prominent role in evaluating the measurement to find out how many clicks a particular post has received regardless of the number of times people who saw this post. You cannot decide success and failure of your Facebook promotion based on the number of clicks only because we cannot ignore those factors, which significantly influences the impression as these impressions are responsible for generating the effective clicks in a day or a week. Apart from these two vital ratios, one more important ratio helps the social media marketers in getting a better interpretation of their Facebook page insight, which are Engaged fans vs. Likes. This ratio gives a better representation of the number of fans who have engaged with your post in terms of likes as well. Engagement is the true measure of how your content communicates with your audience and an engaged fan will not necessarily click on your post but he or she might view your post or generate a story from your post. Lifetime people who have engaged with your post: It means total number of people engaged with your posts or page. Lifetime total likes: Total number of likes received by your Facebook Page. This ratio indicates percentage of fans who clicked on your post without considering whether they view that post or not. It has a direct influence on your EdgeRank and perceptibility. Rather than just being a ratio, it is the barometer for reading the success of your content. Like denotes that someone has clicked like button on your post either through your FB page or through a website that prompts to your FB page. In the picture displayed above, you can see that the Fan page of Lionel Messi has 843,311 likes while 152,120 people are talking about this. The Engaged fan vs. Likes ratio for this Facebook page is 152,120/843,311, which is a great example because it clearly indicates that this page is successful in engaging people over it and has carved a successful niche of those fans who have liked this page. Why this ratio is vital: The ratio offers a better idea of the percentage of your fans who holds interest in your posts whether they liked your posts or not. If you evaluate this ratio, you will know what to implement to make more people engaged with your posts because engagement of fans is very important for the successful branding of your business. Lifetime Post Impressions: It denotes the number of time a post is displayed to its fans. This ratio represents the percentage of times a post is viewed by your fans that resulted in stories. Why this ratio is vital: While a click shows the interest shown by people towards your post but clicks that results in stories makes your post viral over social media platform, which ultimately help in popularizing your business brand among your fans. It also reflects the capability of your content to motivate a second action, which serves as the endorsement base for your business. Measuring your Facebook Page performance to know the popularity and branding status of your business is of utmost priority for the success of businesses. However, instead of performing the FB Insights metrics evaluation manually, you can use free tools like Simply Measured and Page Analyzer but it is important to choose paid tools like Wisemetrics, Pagelever and PostAcumen for better results and enhanced accuracy. Overall, it is very significant to make wise decision regarding the choice of Facebook Insights metrics so that you can promote your business well over social media platforms thus taking your business productivity to new levels of success.